In the 1960s, it was discovered that gravity in Hudson Bay and surrounding areas is lower than in the rest of the world. How? Well, it is pretty complicated, so pay close attention. One theory involves convection in the Earth’s mantle. A complex sentence, I know. So let’s break it down. First of all, it is important to know what convection is. Convection means “the transfer of heat through a liquid or gas, caused by molecular motion.” Secondly, the Earth’s mantle consists of magma. Magma is a hot, molten rock that is always moving in order to create convection currents. Convection brings the Earth’s continental plates down, which means the mass in that area gets smaller and therefore, there is a reduction in gravity. Considering this paragraph is basically a brainteaser that contains a lot of complicated science words, I will spare you the second theory. You might not have guessed it, but Canada is the number one most educated country in the world. According to a study done by the Organization for Economic Cooperation and Development, more than 56 per cent of residents between 25 and 64 years old have a college degree. Back in 2000, this was only 40 per cent. Despite the number not being crazy high, Canada is doing a much better job than most countries. The United States, ironically, ranked sixth place in the list of “the 10 most educated countries in the world” created by the OECD. With Japan being second place with 50.5 per cent, Canada and Japan are the only countries who have surpassed the 50 per cent mark. It might not be Christmas just yet, but that doesn’t mean we can’t talk about it! In fact, Canada has such a great fact related to Christmas, that I just HAVE to tell you all about it. In Canada, you have the opportunity to send a letter to Santa Claus. There is an actual postal address you can send your letter to and as long as you include a return address, Santa will read the letter and send one back to you! Santa and his elves make sure every single letter is personal and exciting. Don’t worry; you don’t have to be a kid to participate! You just have to believe in Santa and the magic of Christmas. Have a great weekend everyone! See you on Sunday when we do our hike! My weekend? Great. Active. Short. Sunny. Full of snow. As all of you surely know, last Thursday was the National Margarita Day. Of course, we had to celebrate this important event. Therefore, we went to “La Casita” on Friday, a Spanish restaurant in Gastown, where you can get a huge margarita (so big that you can easily share it with two or three people) in different flavours for only $24. Saturday was a perfect winter day: sun and snow in whole Vancouver. Great conditions for a hike! The destination this time was the Norvan Falls in the Lynn Headwaters Regional Park. The whole park was covered in a thick layer of fluffy snow. We hiked for about five hours along a river and up the mountains, always surrounded by beautiful scenery. Since the sun was up and started melting the snow, the hike became a game whenever a little snow avalanche fell down from the trees. When does it come down? Who’s head is getting hit next? But we managed all slippery stairs and other obstacles successfully. After a quick stop at home to get some dry clothes and a hot shower, it was already time to leave again. Many familiar faces found their way to the escape room. My team and I gave the best to solve all the tricky riddles to escape from the zombie apocalypse. Unfortunately, time was running out, so we could not open the door ourselves. To calm down from all the stress, we headed off to Malone’s for a beer or two. 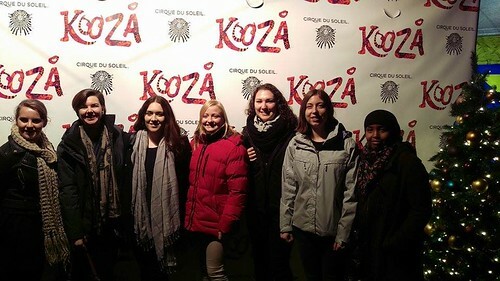 The final stop of the night was the Roxy. Only a few hours later, my alarm went off again. I jumped in my ski pants and headed out to the science world skytrain station where already some people were waiting with their skies on their shoulders. It looked funny since there was almost no snow anymore in downtown. The bus took us to Cypress Mountain, one of the local mountains of Vancouver. After a few minutes of skiing in the clouds, the sun started to shine. The weather changed so quickly up there, it was crazy! While skiing and snowboarding, we had a stunning view over Vancouver and surrounding from the top. The day passed by quickly, so it was already dark when we returned our rentals and stepped back in the bus. Enjoying a full day on the slopes on a casual Sunday is definitely something I can get used to! So I am starting off this week with sore muscles, but great memories. I hope that you also had a great weekend. Time to make plans for the upcoming ones during our PuB NiGHT at The Beaver Bar on Wednesday. The first week of the year is already over. I can imagine you are still tired after working the first days of the year. But no worries, the weekend is here. If you still have no plans, keep reading and maybe I can help you out. There are still a lot of Christmas activities going on. Go for example to Bright nights at Stanley Park, Canyon lights at Capilano Suspension Bridge, Festival of lights at VanDusen Garden or go the last weekend of Peak of Christmas on top of the Grouse Mountain. On Saturday is the Nat Bailey Winter Famers Market at Vancouver’s Nat Bailey Stadium. Go to one of the many food trucks, music entertainers and all the other things you expect on a market: Fruits, Meats, baked goods, crafts etc. Prefer something drier? We are going to RIO Theater for the Lord of the Rings Trilogy. Expect trivia, games, fun and the most important thing: the Lord of the Ring movies. On Sunday everybody is of course going to the church. Even when you’re not a really church person, you can check out St. Andrew’s Wesley United Church. This Sunday they have Jazz festival called Jazz Vespers. You can just walk in, admission is by donation. Have a great weekend and I hope I will see everybody (in PJ’s or not) at the RIO Theater tomorrow! us gazing in wonder at those stunning performances all night. We celebrated the Winter Solstice at Dr. Sun Yat-Sen Chinese Garden, which was filled with lanterns and ornaments. To nicely end Christmas and the holidays we went to Stanley Park to see the hundreds of colorful lights that lit up the Park and boosted our Christmas mood. Our visit to the Capilano Suspension Bridge was the last event of 2015 walking from tree house to tree house. In the first week of January we went Ice Skating at Robson Square. No one fell on their behind – except me. After a couple of rounds we warmed up with hot apple cider. The weekend after we had dinner at the legendary pizzeria Ludica. They have the tastiest pizza in Vancouver and even better – they have over 700 board games. We played Scotland Yard all night – Mr. X won the game. 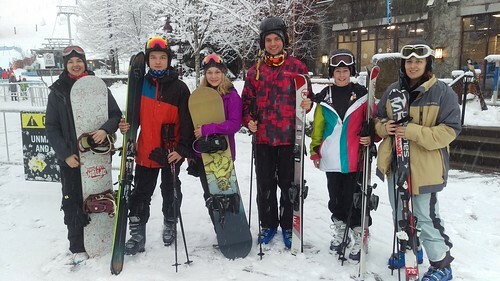 Last but not least we went on our amazing Whistler Trip at the end of the month. And I promise you, if yo u visit Whistler once, you want to go back. It is such an active and fun town with tons and tons of outdoor activities to do. e Nexis celebrated Chinese New Year on Valentines Weekend by watching the parade and by seeing China and Canada from above at FlyOverCanada. 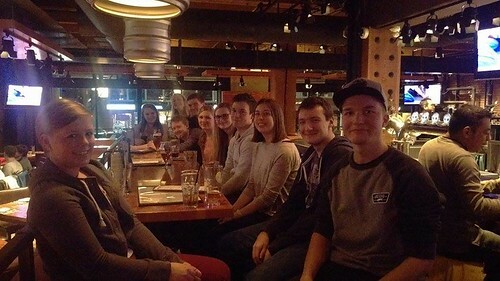 We are excited and looking forward to the hockey game next weekend – Canucks vs. Sharks – this is going to be a fun game. Looking back, you realize time flies. I have been organizing events for INTERNeX for a couple of month now and spend six month in this wonderful country. I had an awesome time.Soon it is time for me to move on. I am so jealous that you all will stay a while longer getting to enjoy the summer in Vancouver – the beach, the ocean, barbequing, hiking and so much more. 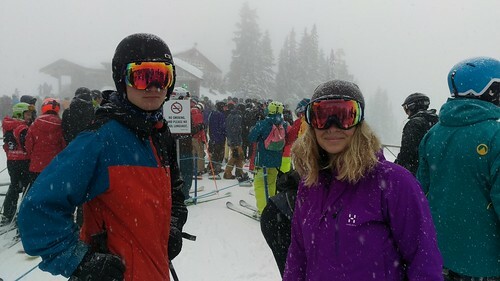 We were so excited to go to Whistler for the weekend as the weather forecast had promised us a lot of new powdery snow. On Friday we met up at the Pacific Central Station and got on the bus via Squamish to Whistler. The Sea to Sky Highway has a lot of spectacular views to offer – snow covered mountains and the wide blue ocean right below. Late afternoon we checked in to our Hostel and hurried up to get ready for a night out in Whistler Village. We had dinner and drinks at the Garibaldi right next to a warm fire place while it was snowing fluffy, white flakes outside. Early next morning we got up, had a hearty breakfast, made sandwiches for lunch and headed to Creekside Gondola. 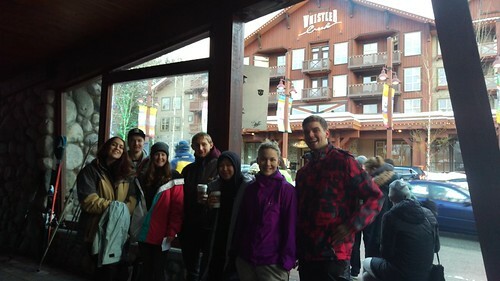 Some of us had to pick up their rentals and buy lift passes and we lined up for the gondola to take us up to Whistler Mountain. It was snowing the whole day, the visibility was not the best but we had nice deep powder snow to ride and ski on. 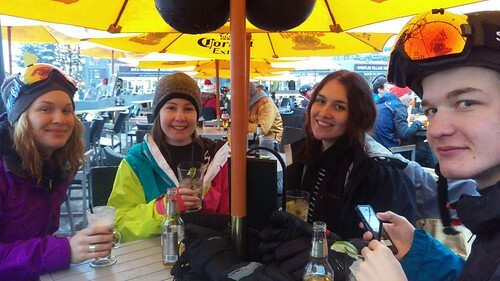 After an exhausting and fun day we sat down at the Longhorn and enjoyed some Après Ski drinks like Peppermint Patty and beer. On Sunday the wake up call was at 6 am – we wanted to be on the slopes as soon as possible – and around 8 am we were sitting in the gondola. The beginners were improving their skills on the easy slopes while the advanced skier and rider were going down of-track slopes. The Peak2Peak Gondola is the perfect opportunity to relax, sit back and take in the view during the eleven-minute ride to Blackcomb Mountain. The bus that would take us back to Vancouver left at 4.30pm, so we got off the skis and the boards at 3.30, got our stuff and changed. Everyone fell asleep on the bus right after we left Creekside. The last couple of days left us happy and exhausted – a perfect weekend.